Hmm, small world. I attempted to initiate contact with the "seller" of this piece immediately after it was posted on ebay. 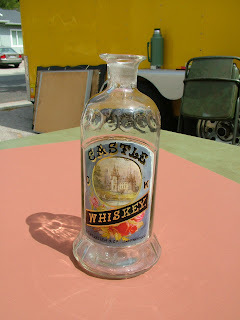 It was item # 230377200595 / RARE LABEL UNDER GLASS CASTLE OK WHISKEY BAR BOTTLE. I dangled a mammoth carrot in front of them, basically a blank check, but never even received the courtesy of a "get lost" response. Not once, but twice. I try to stay away from notably flawed bottles and this piece was damaged, presenting with a large crack in the neck at the front. But, to quote Val Kilmer as Doc. Holliday "my hypocrisy only goes so far" and I was more than willing to live with the damage. I put in the number to e-bay and it popped up still, so I copied the photo and have pasted it above, nice bottle even with the crack.